Breaking my blogging fast to give you a present: perspective. Thanks to my pal, secret codename: SBPWK, for the link. Some wise friends of mine have convinced me to take an internet break until January. Therefore, this will be my last scheduled post until the new year. I wish you all a peaceful, thoughtful, and joyful December. 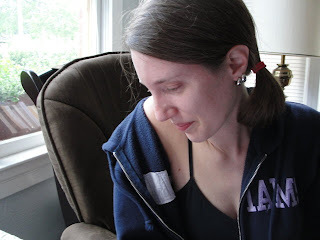 For anyone wanting bloggy reading while I'm gone, I've compiled a Best of the Blog list, randomly chosen by yours truly. Many of these are posts I wrote a long time ago, before my blog was getting so much traffic -- which means that they might be new to you. It's kinda long, the list, but... well, it's only for you to read if you want, so ignore it at will! I was thinking the other day that it'd be nice to live on the planet where the kingdoms of Attolia, Sounis, and Eddis are. After all, that planet has Gen, Irene, Helen, Sophos, Costis, the magus, and some chill-inducing gods, which makes it a damn awesome planet. At the end of my deliberations, though, I decided I like our own planet best, and here's why: we have Megan Whalen Turner. You are not going to be disappointed by this book. Housekeeping. Also, Which Muppet Are You? A reminder to people curious about book news: I now put stuff like that behind my News link. A reminder to people with general, factual questions (for example, how to purchase signed copies of the books): you'll almost certainly find your answers, and more, on my Contacts, Info, and Credits page or in my FAQs. I have a few other links, too, where you can probably find the info you're looking for -- see my home page. Here's my question for you today: Which Muppet are you, and why? Joyce [pleasantly]: Have we met? Spike: Um, you hit me with an axe one time. Spike: Remember? [helpfully brandishes imaginary axe] "Get the hell away from my daughter! Rawr!!!" So, I promised that I'd let you know if I stumbled across any gems in my reading. I have. The Magician's Elephant, by Kate DiCamillo, is a book about magic, love, and longing, and it is fabulous. 8. Warm hellos to everyone coming to my blog from NaNoWriMo. Welcome! The comments you've written here and there in various posts have brought tears to my eyes. Thank you! I really do know what it's like, and I really do hope you'll keep writing despite how hard it is, and despite all the voices that tell you not to. (To any of my regular readers who have no idea what I'm talking about, I wrote a pep talk for National Novel Writing Month, which you can read here.) To all those writing novels/short stories/fan fic/WHATEVER this November: good luck. Don't forget to be kind to yourself and KEEP THE FAITH. 7. 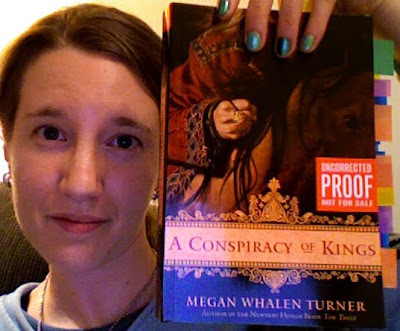 For those of my blog readers who are Megan Whalen Turner fans -- and I know there are a lot of you -- check out her interview last week at Hip Writer Mama. "Hello, hello, hello, hello. Goodbye, goodbye, goodbye, goodbye. That's all there is...."
"It was my candle to St. Jude"
Announcement: I ♥ librarians. Why? Because librarians love information, know how to find it, know how to use it, and know how to help other people find and use it; and because librarians love, care for, and offer us BOOKS. And school librarians, in particular, share their awesomeness with young people without condescension. Thanks so much to the New Jersey Association of School Librarians for inviting me to their fall conference this past weekend. You guys are inspiring. Housekeeping: I got a great suggestion the other day from an audiobooker who wished she could see the maps of the kingdoms while listening. Please see my new link to the left, Maps of My Book World, which shows both the maps so far, both drawn by Jeffery C. Mathison. Click on the maps to make them bigger. If you happened to see me at Books of Wonder on Tuesday covering my ears, singing "la la la la la la! ", and seriously invading Scott Westerfeld's space, I swear, it was only because I was trying to avoid hearing the Liar spoilers happening on my other side! 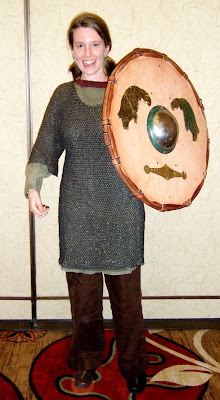 Justine Larbalestier was being an absolute champ trying to protect me from her conversations with her readers, but really, there's only so much an author can do! :o) Anyway, I got through unspoilered, and clearly, I need to read Liar ASAP. Oh, and the event was super. Thanks to everyone who came! If you're a book blogger who wants to sign up for the Book Blogger Holiday Swap -- basically a Secret Santa among book bloggers world-wide -- today is the last day. My assignment was to memorize the names of the stars." "You meanallthe stars, inallthe galaxies?" "Yes. If he calls for one of them, someone has to know which one he means. Anyhow, they like it; there aren't many who know them all by name, and if your name isn't known, then it's a very lonely feeling." I wonder if my characters feel lonely until I've named them? How patient the characters must be whose names I keep changing! Sometimes I forget how much they depend on me, for everything. Proginoskes and Meg are both Namers. Here's something else Proginoskes says: "When I was memorizing the names of the stars, part of the purpose was to help them each to be more particularly the particular star each one was supposed to be. That's basically a Namer's job." It's been a while since I've shown you a brand new cover for Graceling. Behold! 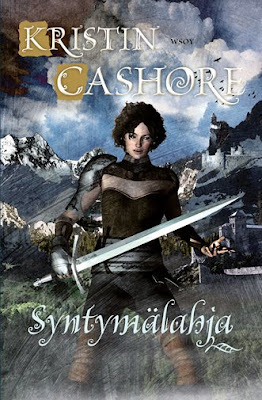 This is the Finnish cover. What do you think? I love it to pieces, and nothing you say will stop me from loving it to pieces, so do your worst. In particular, I love finally seeing a short-haired Katsa, and -- the mountains and castles in the background -- *flops* -- ! Maria Lyytinen, who is the translator, tells me that the back cover shows a scene of mountains at sunset/sunrise. She also explained that the word "Syntymälahja" encapsulates the idea of a gift received at birth. Reminder: I love Finland. Dear sister, secret codename: Apocalyptica the Flimflammer: I cannot wait to give you a copy of Syntymälahja! Via Deborah: Stacy Whitman, freelance editor and Simmons Center for the Study of Children's Literature grad, is trying to start a new publishing company. Tu Publishing will be "a small, independent multicultural SFF press for children and YA." 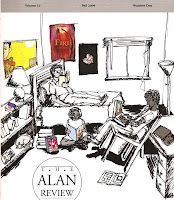 A small press devoted to multicultural fantasy/SF -- good idea! But -- it will only get off the ground if it gets enough funding. Care to help? There are benefits to pledging, and you'll only pay your pledge amount if the project actually launches. Go here for more info. You can give as little as $5, and you can do it using your Amazon account, if you have one. If Tu Publishing can raise $10,000 by December 14th, they'll start accepting manuscripts in January. So, the blog posts I like to write are the ones that don't have anything to do with news. They're the posts about random thoughts, the poetry or poll posts, the posts in which I answer FAQs or talk about writing and life. They are NOT the posts in which I say, guys, here's what's happening to my books in the world. And recently I've felt overwhelmed by news in my own posts.... and that's why I've decided to make a link on the left for news, and put all news there. If anything spectacular happens, of course I'll mention it in a blog post (I'll let you know if I win the Nobel Prize in physics, make the Olympic figure skating team, or sprout an extra head, all of which are equally likely), but from now on, any news will be recorded behind my News link, and not here. Make sense? We'll see how it works. This leaves me free to talk about the three most recent books I've read and loved! The discussion of favorite and least favorite words has been delightful. I've learned that Schmetterling is the German word for butterfly -- isn't it beautiful? Today I'm starting with a thank you to my readers. THANK YOU for making Graceling a bestseller in Germany, and THANK YOU for putting the American paperback of Graceling on next week's (Sep 27) New York Timesbestseller list! I am overwhelmed. I am staring blankly like a slow loris. And giggling. Hi everyone! I'm sneaking in a Wednesday post just to remind y'all about my live chat at readergirlz this evening at 9pm Eastern/6pm Pacific. The chat will take place here and last an hour; feel free to stop by! Also, the blog tour has begun; the schedule is here if you're interested in following along. ETA: What about least favorite words? Please feel free to share/explain them, too! So, next week I start a three-week blog tour. The theme of the tour is "Getting to Know the Characters of Fire," which means that at each stop on the tour, I'll introduce a character (or characters) from Fire. My character intros have been carefully screened by a team of experts (read: my patient and generous friends Deborah, Sam, and JD -- thanks, guys) to ensure that they're accurate (*ahem* for example, Sam pointed out that I was calling a character by the wrong name) AND not too spoilery. Each of my host bloggers will be giving away a signed finished copy. So -- if you're curious about Fire -- or interested in checking out a bunch of cool book blogs -- or if you'd like 15 chances to win a signed copy -- check it out. The schedule is below. I'll close by sending a big thank you to my host bloggers. Thanks to each of you for letting me visit! I'd also like to thank Jillian Laks, the wizard at Penguin who organized the tour! It's been a while since I've lived in a place where September marks a true change in season, so the weather in Massachusetts lately has been making me beside myself with happiness. In Florida, the weather didn't dip below the 80s (I mean, even at night) until maybe November. In my excitement, I've been dressing too warmly. Autumn, you are welcome! Those of you who've been reading my blog for a while know I used to walk along the St. Johns River almost every day. Well, now I walk along the Charles River... no pelicans, but there are geese, and crew teams in long, graceful boats. It's lovely. And one of the windows in my new home faces the rising moon :o). Last week, I flew to Florida to meet two new friends. We also had dance parties. Do you realize how many songs lyrics are secretly about babies? For example, "I want a girl with a short diaper and a LOOOOOOOOOONG blanket." Or, "If I had a boat, I'd go out on the ocean, and if I had a baby, I'd bring her on my boat." And then, maybe later, we felt a little better. ...my new friends don't sleep that much. Frankly, the rest of us are a bit boggled by their stamina.